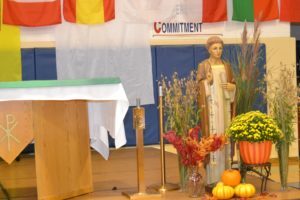 to show off their school, but they celebrated together at Mass, on the feast of St. Viator. 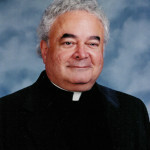 The timing was deliberate as it underscored the school’s patron saint, whose life was dedicated to educating young people in the faith. 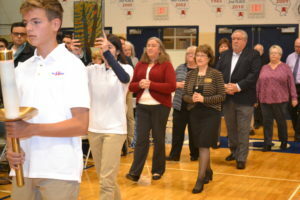 The Mass drew students, parents and grandparents to gather in the Cahill Gymnasium for the celebration. 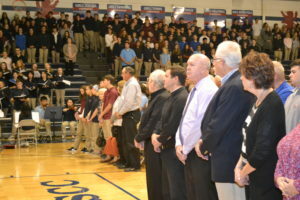 It opened with a procession of Viatorian associates, pre-associates, brothers and priests, including many who were alumni of Saint Viator High School. 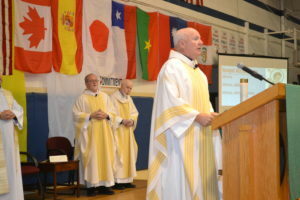 “We warmly welcome all the grandparents here,” said Fr. Dan Hall, CSV, vice president of Viatorian identity and mission. Students participated in many aspects of the Mass, from those in music ministry to Eucharistic ministers and cross bearers. In addition, some 65 students were commissioned at the end of Mass as members of the Campus Ministry Team, charged with enhancing the spiritual life of the school. In his homily, Fr. Hall described who St. Viator was and why Fr. Louis Querbes chose this little-known saint to be the patron of his new religious congregation.